Settlers of Catan may have been the first modern designer board game I ever played, but it took Carcassonne before I realised how far things had progressed from the grim, dark days of Monopoly. Catan I enjoy, in moderation, but I find it frustrating because of the deep, baked in randomness and its almost arbitrary cruelty. As innovative as it was for its time, Catan offers an experience that I think is worthwhile mainly for its archaeological value. 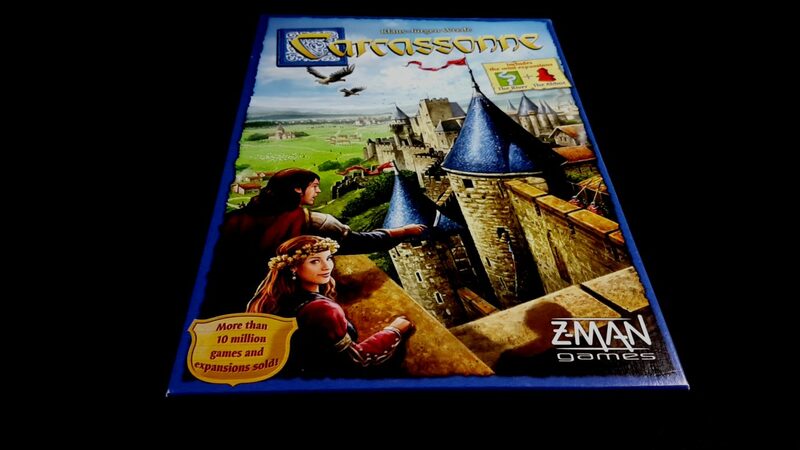 Carcassonne on the other hand I can play over and over and over again without losing enthusiasm for its beautiful, elegant design. It’s incredibly simple. It’s so simple that the entire game can be explained during the vanishingly short lifespan of a Game of Thrones character. And yet, it’s almost unspeakably deep – those simple rules mesh together into a gorgeous, sparkling puzzle. It’s intensely satisfying from start to finish, whether it’s in the building of the landscape, the gradual nurturing of your burgeoning city states, or the quiet satisfaction that comes from building a field that is absolutely going to devastate everyone else in the game at its termination. There’s an awful lot to like in this svelte, enticing box. 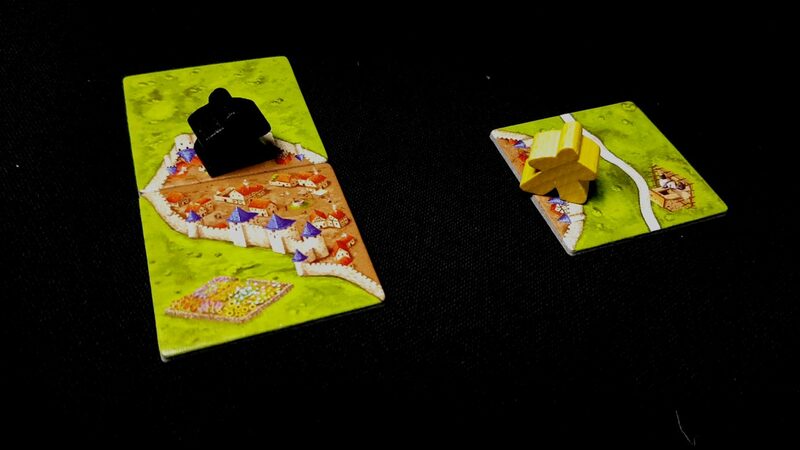 A game of Carcassonne progresses through the collaborative building of a tile-based environment, and the strategic placing of meeples on the features that tiles reveal. 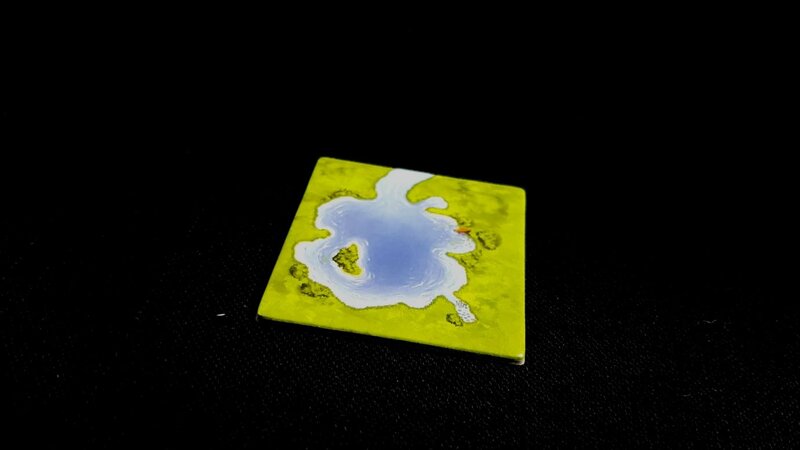 Each turn, we take a tile off of the supply, and place it down in a valid location. There’s a starting tile, from which everything begins – if you’re using the River expansion, which we are in this review, it’ll be the headwaters of the waterway that’s going to cut through your beautiful landscape. The River is the only expansion I’d recommend as all but mandatory, because it has a great impact on opening up the world you into something with real heft and opportunity. What I love most about rivers is you can’t step in the same river twice. Tiles must be played in a valid location – every edge must be compatible with every other edge they touch. That limits your options considerably – sometimes you need to start expanding the map away from what’s in your best interests just because there are no good options for the tile you just drew. Or, even worse, the only options available are advantageous to the other players. A tile is only as valuable as your ability to exploit it – if you can’t, burn it down and salt the earth on where it once resided. Each time we play a tile, we also have an opportunity to place one of our seven meeples on the features we reveal. As we complete and score features, we can reclaim the meeples we placed on them. If we run out of meeples, we lose opportunities for picking up points – so we want to be careful about where we place them and how long we’re going to have them embedded. These little guys and gals are vital to your war effort. Did I say war effort? My word, that sounded more aggressive than I meant. Ha ha ha. But seriously, if you try to block off my city one more time I’m going to kill you and everyone you love. I call this city ‘River City’. Because I am painfully unoriginal. Here, we can see the landscape after three tiles have been played – the third of these has a road, and part of a city. We can place a meeple on either of these to indicate its role as a ‘knight’, taking control of a city, or a ‘thief’ on the road. We can only play one meeple per turn though, so to pick one is to forfeit the other. Knights are reclaimed when the city is complete, and thieves are reclaimed when the road is complete. Or, we can play the long game – we can place a meeple on its side, or on its back, in a grassy area to make it a farmer. Farmers are scored only once the game is over – once we play them, they stay played. That’s a big loss, but it’s also one of the most effective ways to generate big points for a player. A well placed farmer can flip a loss into a win. A badly placed farmer is just a constant, permanent and unchanging reminder of your own deep inadequacies. Look at it, sitting there on the board. Mocking you. Probably sleeping with your partner while you’re building cities. Don’t think we don’t know what you’re up to, little farmer. You have the cold, dead meeple eyes of a killer. We know what you’re up to, Farmer Meep. Another player can’t claim a contiguous field, city or road if it’s already occupied. 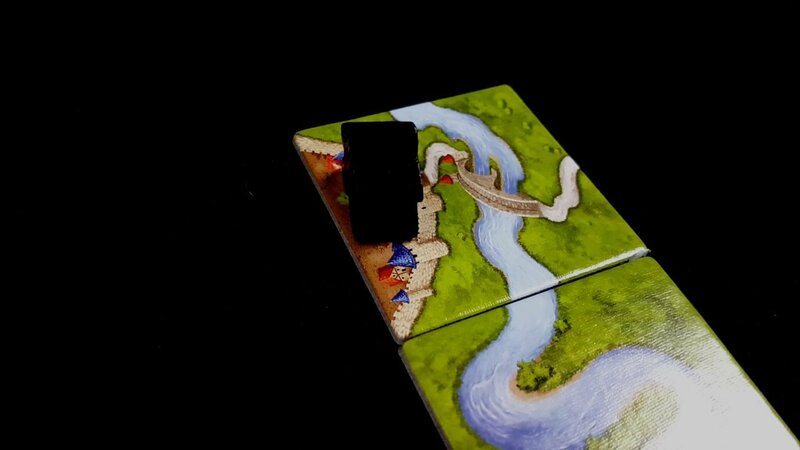 But, you can play a meeple on a disconnected segment even if it’s almost inevitable that it’ll end joined up with the other part at some point. 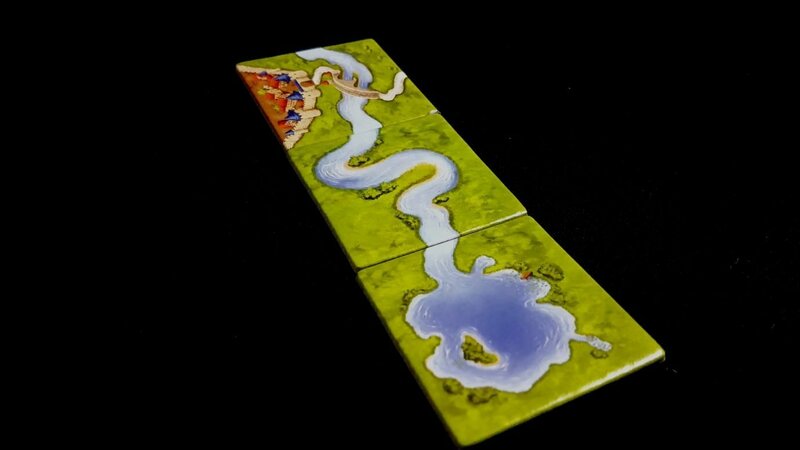 This is one of the few ways in which Carcassonne permits any kind of direct competition over resources. Players take turns laying down tiles, and playing down meeples (if they have any) until all the tiles are gone. Certain tiles will ‘complete’ features, and this generates instant scoring. A city is worth two points per tile, plus two points per coat of arms in the city. A completed road is worth one point per segment. Monks, placed in cloisters, earn nine points once their monastery is completely enveloped by other tiles. You can really taste the Jesus. If a feature has become contested (for example, two knights in a city) then the points go to the player with the most meeples within the bounds of that feature. If there’s a tie, both players get all the points. As usual, the player with the most points at the end of the game wins. It’s a game then of meeple management – of circulating your workers in and out of your supply, trying to create an engine of points generation that’s sustainable. We do the scoring after we lay down meeples, so the game encourages a strategy of completing objectives, briefly allocating meeples, and then scoring those meeples over the course of a single round. Invest too deeply in too many of the wrong features, and you’ll have only a limited ability to earn points through this system of rapid deployment. 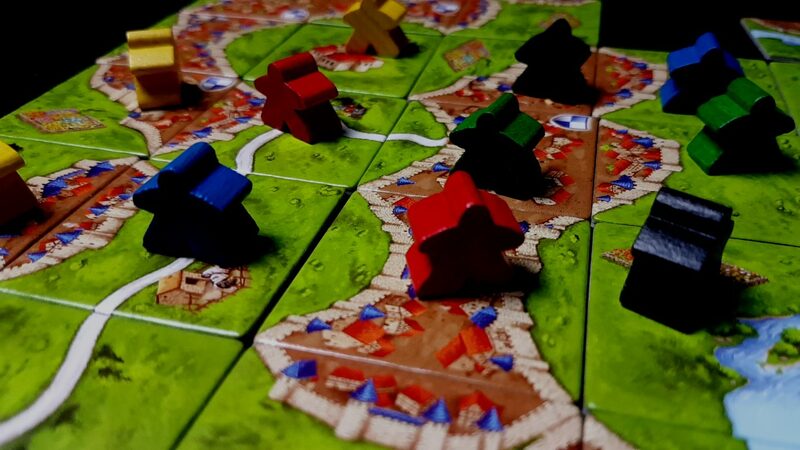 That in itself is a satisfying mechanic, but Carcassonne is also a game of area denial – to play competitively, it’s important to see what’s important to your opponents, and play tiles down that are likely to interfere with those plans. If they’re about to score a big city, why not drop down a tile that vastly extends the city size so that they have a much harder job of doing it. If they’re about to complete a cloister, lay down a road that limits the tiles they’ll be able to play around it. If their thief is on a nice stretch of road, join in to another stretch of road that terminates in an almost impossible cul-de-sac. Ensuring that your opponents lack options is how you make sure that they don’t shoot ahead of you in points. You trap them in a vice that they can’t escape, because you’ve made the landscape outside the feature too inhospitable for success. If you can play the right tiles in the right way, it’s even possible to steal lucrative features away from other players, or force them to invest so much in the effort of retention that they are unable to action any other scoring strategies. Or, perhaps you’re going to be best served by helping them complete a few features here and there because of the farmers you laid down earlier. Oh yes, the farmers – they’re easy to forget about. That’s what makes them so dangerous. That, and their dead little meeple eyes. Farmers are scored based on the number of completed cities that their field touches. The rules are a little awkward, but you have to think of it like a flood fill on your favourite paint application. As long as they don’t have to cross a road or a river, the farmer can get to any city that has a grass path that reaches to its walls. Several fields may supply the same city, so if your opponent will get four points for the city but you can get six from your farmers, then lend them a friendly hand. They might not even realise that you’re screwing them from behind that smile, because people often don’t mentally score the fields until it’s too late to change their impact. Even if you realise the power of a strategically placed farmer, often all you can do is watch sadly as more and more cities link into the field, knowing the farmer within it is getting richer and fatter off of your labours. At the end of the game, unfinished features get scored – less lucratively, but still enough to make a meaningful difference. The big cost of an unfinished feature though is in opportunity – the longer a meeple is out of circulation, the less it’s contributing to the number of victory points you have available. More than that, there’s a psychological cost – part of the satisfaction of the game comes from just laying down tiles and constructing a meaningful landscape. Gaps in that landscape have all the aesthetic appeal of a gap-toothed smile. The completionist in us wants to see closure. 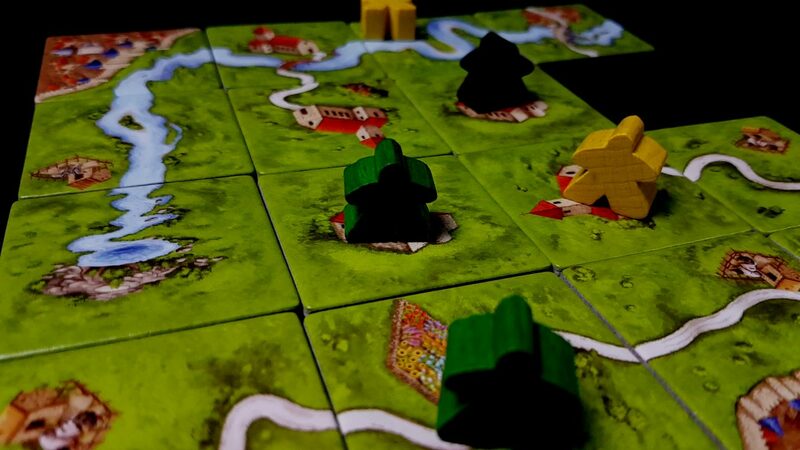 Carcassonne is a tremendously simple game – so simple that it’s perhaps the quintessential gateway game. Anyone can be playing this within minutes and having great fun. It’s remarkably meditative as you mull over the best place for your tiles to go, watching the territory unfold before you. And yet, it can also be very tense as you look at your sprawling metropolis, rich with its pennants and territory, and know that getting the final tile you need to complete it would be the difference between winning and losing. It can also be infuriating to see someone draw a tile that increases the size of the city and play it down, knowing that the chances are pretty good you won’t have time to draw the three you suddenly need. Sometimes you bite off more than you can chew, and sometimes you find someone stuffing extra bites down your throat until you choke on them. It can be a surprisingly ruthless game for one with so few opportunities for direct competition. For all its simplicity too, it’s a game in which focusing too much on short-term gain can ruin you – you need to keep a constant eye on the supply of tiles, the rough proportion of the tiles in play versus the ones in the supply, and the precise configuration of tiles you need to gain the right return on your investment. Early on, it’s safe to aim for the big, bustling cities because there’s a fair chance you’ll complete them. If you don’t though, they sit squatting on the landscape like a cautionary tale – as the environment becomes more cramped, the chance of completion whittles away. There’s only a finite number of tiles of each type, and it’s very easy to leave yourself with features that simply can’t be finished. The worst thing about it is that in ninety percent of cases, it’s your own damn stupid fault you’ve been left with the sprawling, impossible monstrosity. Much of the game is spent silently cursing your own hubris. The decisions you make in each turn are trivial – ‘where do you lay this tile’ and ‘do you put a meeple down’. And yet each turn seems laden with portentous impact – perhaps as a direct consequence of the fact the game’s length is a known quantity. The tiles are stacked there, and you can see them gradually dwindle. It’s also likely a consequence of the shape of play – it is immensely broad to begin with, each tile being heavy with promise. At the half-way point, a pivot is reached and play becomes almost claustrophobic in its malevolent confinement. Nobody wants to play at the edges, because that’s where irrelevance lives. Everyone is hovering over the key spaces – the ones that will return double number points if scored… but every turn, the likelihood of a payout gets ever smaller. Those little tiles – they have a lot of weight. It’s amazing anyone can lift the box at all. 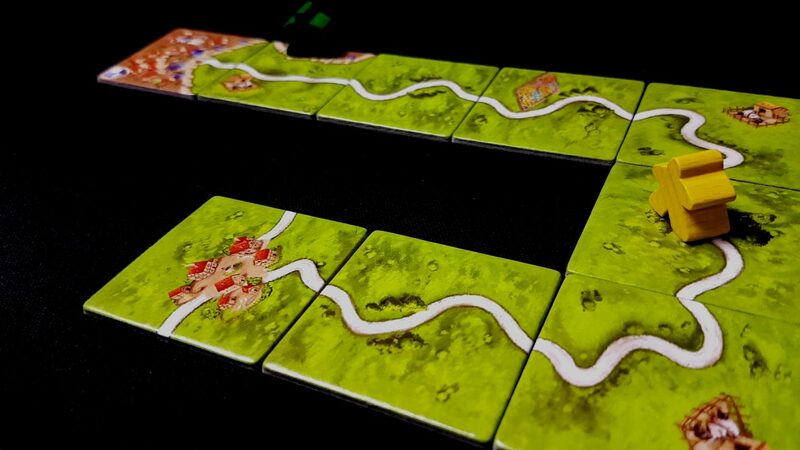 We give Carcassonne a meaty 4.5 here at Meeple Like Us. Despite its age, it still holds up immensely well – many games have iterated upon worker placement and tile-laying since the game was released in 2000, but none have really managed to match its pure design elegance. It’s almost a shame that there are so many expansions you can get for it. It’s a bit like putting lipstick on the Mona Lisa – you have to ask yourself what your contribution is really adding. 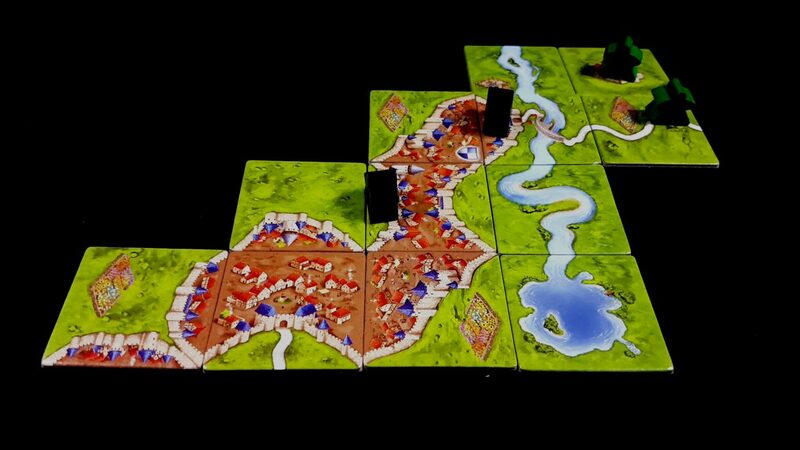 The vanilla game of Carcassonne is like the ocean – and you can drown in its depths if you give yourself permission to let yourself go.